After a 40 minute vigil facing the embassy (the police request to move around the corner was politely refused) – we circled. 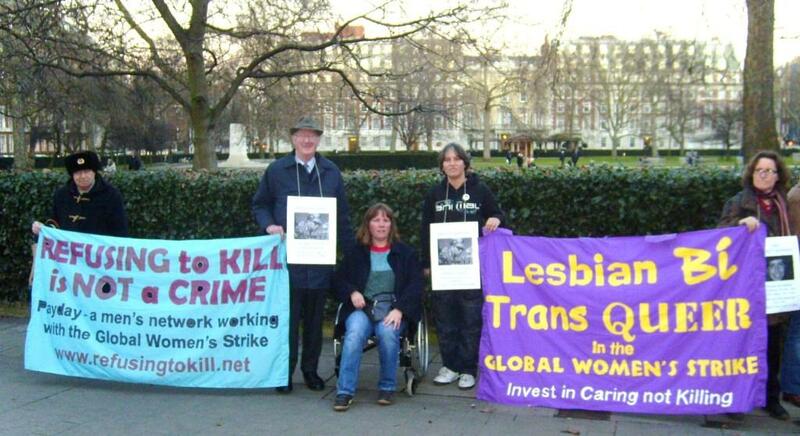 Former U.S. political prisoner Ciaron O’Reilly and British veteran Ben Griffin addressed the assembled. John McClean led us in Dylan’s “I Shall Be Released”. Open forum included Giorgio Riva from Payday men’s network, Anthony from U.S. of A, Didi Rossi from Queer Strike, a woman from a military family in Wales and Andrew Warren, a supporter of Payday men’s network. The Guardian reports that Badley is no longer being held in Leavenworth but in proximity of Ft. Meade. Next court appearance March 15-16. Prosecution claims they won’t be ready unitl August 3rd. Defense objecting to this. Brad is presently deferring a plea. 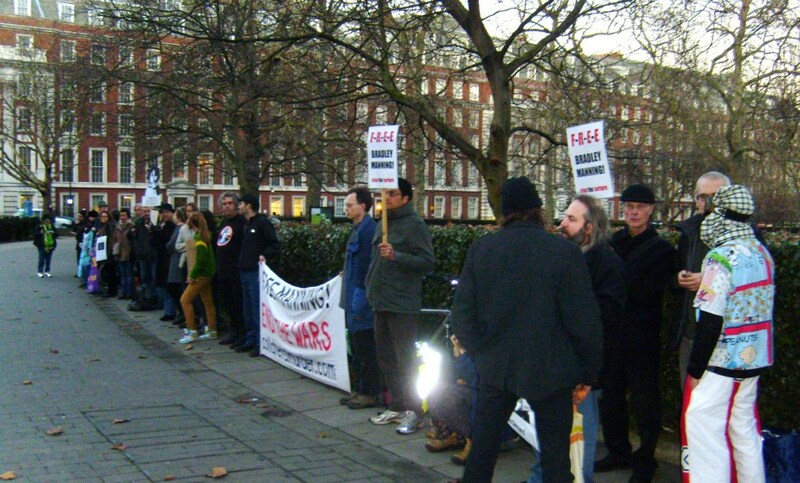 The day before Bradley Manning’s arraignment, 140 gathered in London at an Ash Wednesday event organised by Pax Christi and London Catholic Worker in repentance and resistance to British nuclear weapons. Seven Catholic Workers, a Quaker, a doctor and a priest were detained and searched following the marking of the Ministry of Defence Buiding in Whitehall. This entry was posted in Manning, Reports and tagged anti-militarism, anti-war, Bradley Manning, Britain, Catholic Worker, press release, US, US Embassy, Veterans for Peace, vigil, WISE Up. Bookmark the permalink.